Region: This bug can be found throughout North America. Life cycle: This insect produces three to five generations each year. 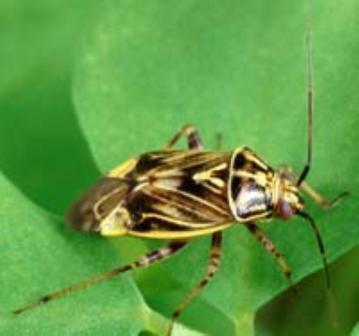 Overwintering occurs by the adult or nymph bug in garden debris, under leaf mold, stones, or tree bark, or in clover, and alfalfa. Physical Description: This 1/4 inch long bug is green to brown with yellow, brown, and black markings, and a yellow triangle at the ends of the fore wings. The curved, elongated eggs are laid or inserted in the stems, tips, and leaves of the host plants. The nymphs are smaller, a pale yellow to green and bear black dots on the thorax and abdomen. Feeding characteristics: This pest, adults and nymphs, attacks most fruits and vegetables by sucking on stem tips, buds, and fruits. While feeding, the bugs apparently inject a poisonous substance into the plant that kills the surrounding tissue, deforms roots, blackens terminal leaves, dwarfs and pits fruits, and ruins flowers. They appear in early spring and are most numerous toward the end of the summer. Controls: Because this bug is very active, sprays are limited in their effectiveness unless used early in the morning when the bug is sluggish due to the cold. The best control is prevention through clean culture. Dusting with sabadilla will take care of serious infestations.